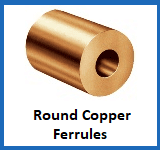 At Rope Services Direct you can buy a range of copper ferrules which are crafted carefully to match the specifications you require. These ferrules act as the perfect fastening to keep the termination point of a wire cable in check. Along with our carbon steel ferrules and stainless steel ferrules, our copper ferrules act as an important part of any wire rope assembly. (Aluminium ferrules should not be used on wire rope). 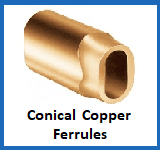 Copper can be chosen as an alternative to the more commonly used stainless steel ferrules when you are securing the end of wire rope made from stainless steel. This has the benefit of reducing the likelihood of corrosion occurring, because the two materials are more compatible in close proximity. All of our ferrules can be pressed in a variety of different dies, matching the size and shape that you have chosen. This allows a sturdy grip on the rope to be established that will be suitable for safe lifting tasks to be completed, while also giving the entire assembly the kind of resilience you would hope to encounter. 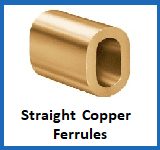 The resilience of our copper ferrules is also linked to the way that they are extruded, with a continuous process ensuring no weaknesses are present. Are you unsure which type of ferrule is the right one for your purposes? Call the Rope Services Direct team on 01384 78004 or use our contact form to send us an email with your question attached. We will help unpick any issue you might need resolving. Copper Ferrules Overall rating: 5 out of 5 based on 6 reviews.